The Artful Sailor is sponsoring the fabulous Team Artful Sailor in the Northwest Maritime Center’s Seventy48, human-powered boat race from Tacoma to Port Townsend, WA. The Artful Sailor’s Floating Store and boat TASWENS will crooze the Pocket Yacht Palooza, in South Puget Sound, WA. Be sharp or be dull! Every sailor and stitchmate needs a good knife and shears. Sailors and lubbers alike need their blades to be sharp. By popular demand TASWENS is excited to host a one-day, basic course for machine-oriented Stitchmates who want to learn how to put that old machine in the closet to use both onboard and ashore. The Artful Sailor ain’t April-foolin’ around this coming Art Walk on Saturday, April 6, 2019. Author, actor, and sailor Emiliano Marino reads excerpts from Men Against the Sea. The Artful Sailor is delighted to deck the halls with the awesome, Aussie, leather-work artistry of Doug Van Allen at the December Art Walk in Port Townsend. 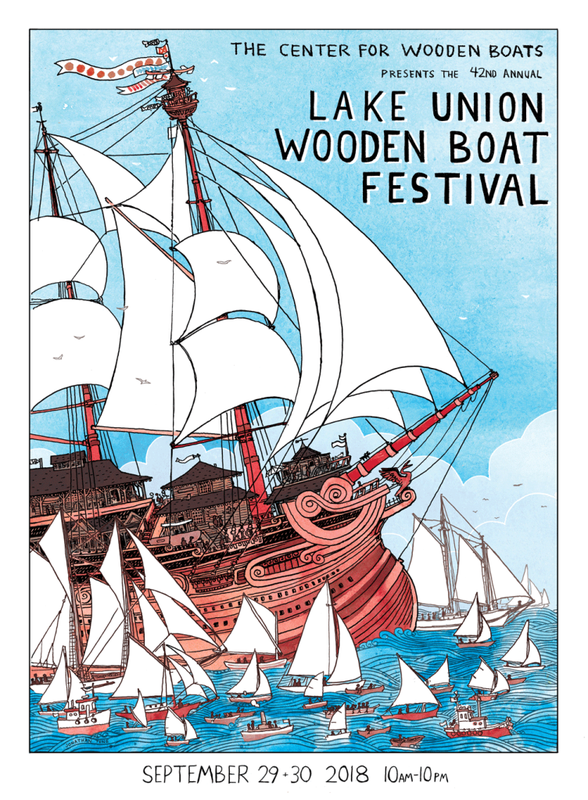 Salty Sue and Emiliano Marino, of Sailmaker’s Apprentice fame, will be at the Lake Union Wooden Boat Festival (10:00 a.m.-6:00 pm Saturday & Sunday) bringing their unique and entertaining blend of salty songs, hands-on marlinespike demos and all ’round chicanery. Specializing in the rigging, working and maintenance of traditional sailing craft, Salty Sue and Marino will display and demonstrate their wares: guidance, goods, tools and kits for the self-reliant sailor. Sharing and passing on traditional handsewing skills using natural and recycled materials is The Artful Sailor’s mission. Harken to the bosun’s whistle and the smell of pine tar and you will find a living museum of maritime trade history. Follow this event with us on Facebook! Salty Sue aboard The Artful Sailor's floating store. Come alongside and raft on up! Commanded by Salty Sue, The Artful Sailor’s floating store will be there with goods, guidance, tools and T-shirts for sailors and lubbers alike. A tempest in a teapot, this maiden voyage of Waterfront Days features rowing races, drumming, tribal canoe demonstrations, lotsa live music, heaps of food and exhibiters galore. Salty Sue and Emiliano Marino bring the Artful Sailor’s floating store and delightful traditional sail work demonstrations to the 42nd Port Townsend Wooden Boat Festival. The Artful Sailor is pleased to feature Steve Hendricks and his wood lighthouses for the August Art Walk in Port Townsend. The Artful Sailor is happy to have Rick Myers as our featured artist for the July Art Walk in Port Townsend. A Pocket Yachter Mini-Workshop with Emiliano Marino and Salty Sue. The Artful Sailor will host artist, Cliff Wood and his nautical watercolor paintings.